The FC-GigE converts between 1000baseSX and 1000baseLX, allowing multimode Gigabit Ethernet equipment to be extended over 10km of singlemode fibre. The FC-GigE has dual SC connectors, with the 1000baseSX port operating at a nominal wavelength of 850nm, whilst the 1000baseLX port operates at a nominal wavelength of 1300nm. The FC-GigE can easily be rack mounted in either a 1U two unit rack mount kit , a 6U eighteen unit rack mount kit. The FC-GigE is part of a range of fibre conversion products from Metrodata. The wider product range offers fibre conversion solutions ranging from 300 baud RS-232, via Nx64kbps rates, through 2Mbps and up to 155Mbps for electrical to fibre conversion; or 155Mbps, 622Mbps or Gigabit Ethernet for fibre mode or wavelength conversion. This application shows a pair of Gigabit Ethernet switches connected over a singlemode fibre using a pair of FC-GigE units. This singlemode fibre could be between buildings (e.g. across a business park), or across a city (e.g. over a rented fibre). 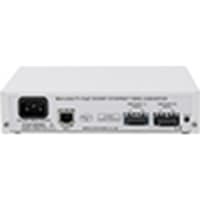 The FC-GigE can also be used to convert between a 1000baseSX interface on one Ethernet device and a 1000baseLX interface on another Ethernet device.